I started collecting the cans after seeing a friend's op-shop collection in the 1990s. I wasn't the only one at architecture school to do so. At the time I did not even know they came with saucers. I am not actively collecting at the moment as the TradeMe market has pushed prices up. 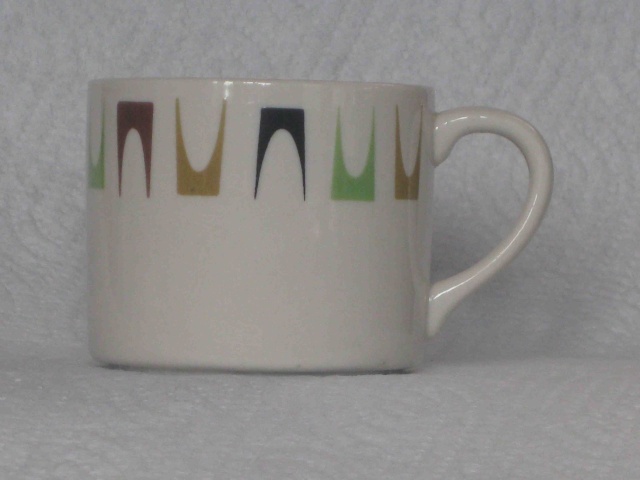 The 1960s coffee can range is based on similar cans made by Rorstrand in Sweden in the 1950s with hand-painted designs by Marianne Westman (please excuse me if I have misspelled this), presumably as an "import substitution". 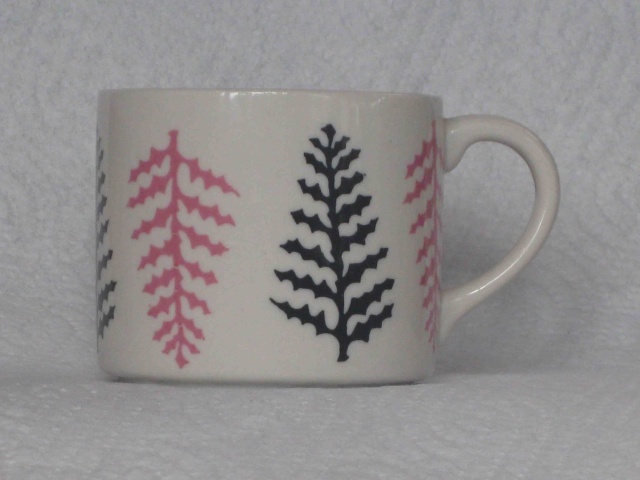 The Rorstrand pottery is not safe in hot water but the CL, being vitreous china, is dishwasher-safe. Crown Lynn's "Blue Tango" name may be a reference to Westman's own "Tango" design although the CL pattern is different. Crown Lynn has actually used Westman's Tango design on bakeware and can be seen on the mustard pot illustrated in the numbers gallery (but not to my knowledge on the cans). 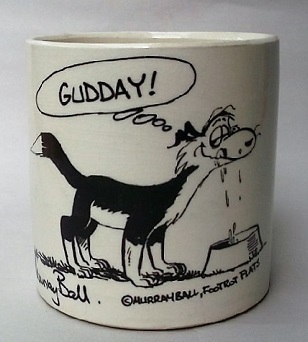 The NZ cans were originally produced as hand-painted designs, later reproduced as underglaze transfers. 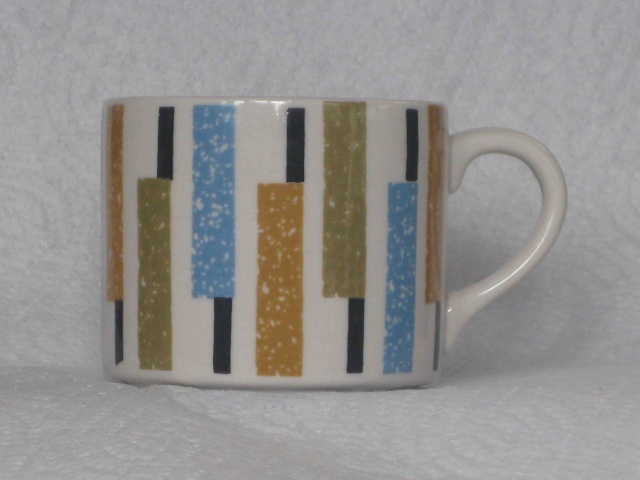 Original hand-painted patterns were: Mogambo, Image, Mexico, and Blue Tango. (Did I miss some?) They later added Fleurette to the range. 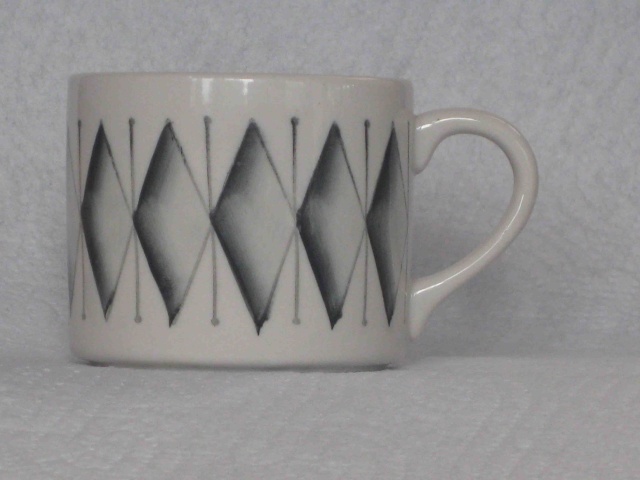 Many other designs were included in the underglaze transfer range. Plain coloured cans were also produced. Saucers were usually plain colours: black, blue, yellow, red. 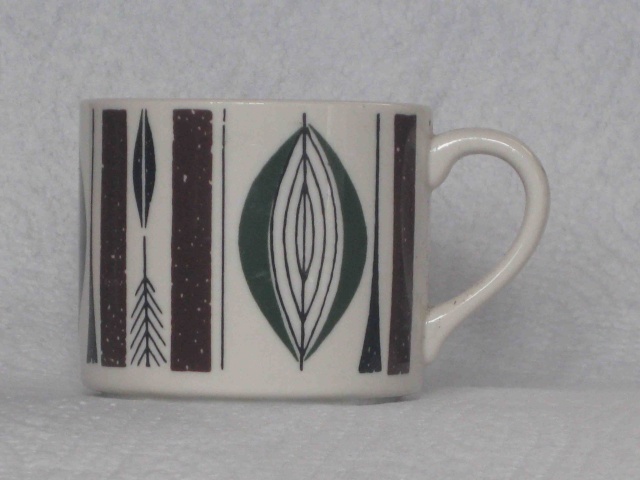 I also have brown and pale green, Fleurette, and one patterned saucer. Base stamps on the original designs gave pattern names and numbers in green. Later stamps were generally in black with saucers marked Cook & Serve in at least 2 different styles. Some have no stamps. I have no images at the moment but with time will add some to the gallery. At last count I had 19 different colours and patterns. Some I have not bothered with as the transfer copies can look nasty. An illustration of hand-painted and underglaze-transfer "Mogambo" coffee cans, remembered by many as the Gregg's coffee cup, can be seen on page 77 of Valerie Ringer Monk's Crown Lynn book. I saw the Mexico cans listed of TradeMe yesterday! so that I could add them to the Crown Lynn Database. 28E: Is this a shape number? I was just washing a coffee can and I noticed for the first time a number stamped into the base. There are no other identifying marks. 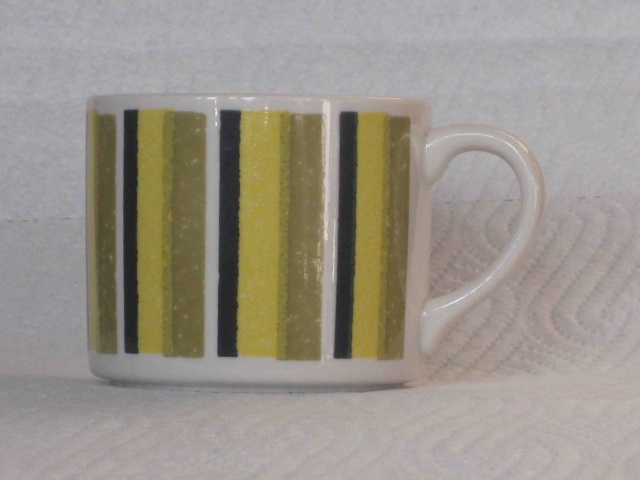 I am familiar with the numbers for the applied decorations which appear with the black or green base stamp but this is a plain Cook & Serve yellow-glazed (mustardy) can with no hand-painting or transfer and no printed bottom stamp. It is definitely a Crown Lynn can. The number is not in relief as on some items, definitely stamped into the clay while wet. The number is 28E. Could this be a shape number? I do not see the use of letters in other shapes in the gallery. I have listed below the patterns I have in C&S coffee cans by categories of my own making, then in alphabetical order (pattern number as well as I can pick out, other marks, suggested saucer). It appears I have 21 different designs. I welcome corrections or additions. 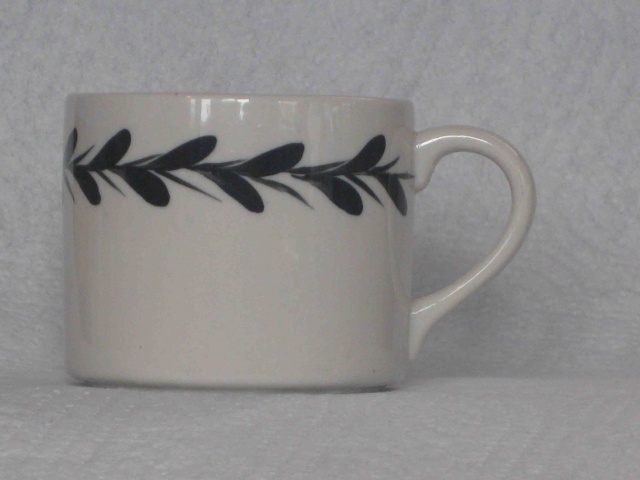 Its nice to see another guy on this forum who's into Crown Lynn Cups. I have amassed quite a collection up to now but have yet to come across a single Coffee Can. I look forward to seeing your pics and sharing Some with you. Welcome aboard, its nice to see an active newcomer, kinda reminds me of myself. I have yet to see any tableware with a letter after a number. I've just looked at the database to compare names and numbers. Most match up, but there are a few that don't. Could you check these against your pieces and confirm the numbers that you posted please. My Blue Tango cans are definitely 423, on both h/p and u-g/t (not 945). It is consistent with the numbering on the other h/p cans too. My Sapphire cans may very well be 823: the ink on the black base stamps bas bled so it's almost impossible to tell 8 from 3. I will look at a few more Mogambos: I have looked at about 10 cups some green stamp some black. Most look like 428 to me but one looks like 420. Wy wife agrees. My son says all 428. He's 9 so he knows best. Go with 428! Thanks. I'm working on the photo. I've added a picture of cans under the patterns and numbers heading above. This shows cans without saucers. Should anyone feel the need I will take a photo of saucers, but the descriptions above should suffice until then. It has urged me to get some of my own and to hunt them out when I'm away in a fortnight. Thanx for the splendid insight and images. When I started cans were around at 2nd hand shops markets etc but they are snapped up by trademe-ers these days. Used to be you could get cans for 50c. Saucers harder to find. I've been at it 15 years and have tons, some bought as individuals, some as sets. I used to like to make up sets and give them to friends. Now I'm just storing them, so I had to dig them out for photos. Once you have one, check the measurements and shape. And that they are vitreous china, kind of sparkly on the ring the cup sits on. 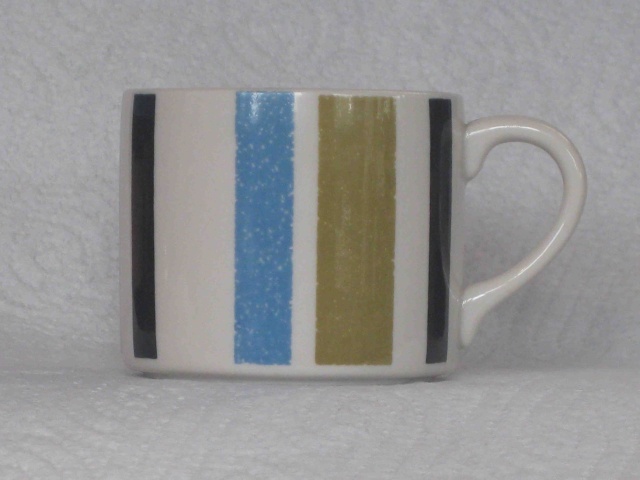 Smaller than other cups but bigger than a demitasse. If you find any new patterns let me know. There are several pattern there that we don't have in the Tableware Gallery. and I could put them into the Gallery and credit you with the pics? I take ages uploading photos so if you can list me which ones you want I'll give it a go. My camera takes jpegs in tens of megs and I can only reduce them to 4-500k so you may have some work to do. When I post I note that the right side of the pic is cropped so I'll leave the images baggy there if you want. Tell me a specification for your needs. It may pay for me to send them to you as raw as possible so you can crop and reduce the ks for yourself. I can place any cup on its correct saucer if you want those. Generally of course they are plain colours, but the one I call unnamed design 2 has matching sources. 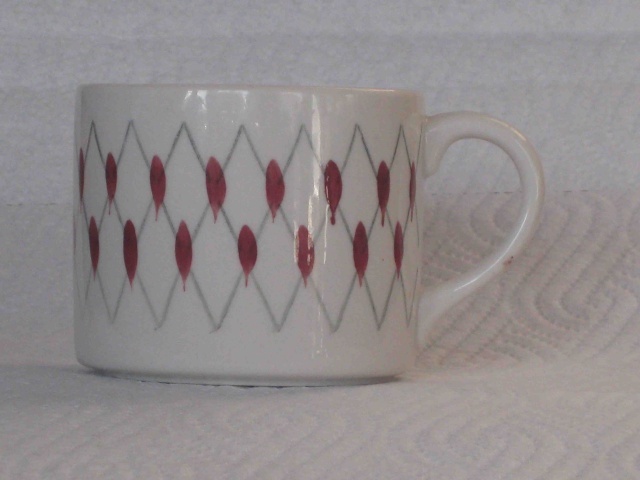 Anyway, its the pattern you want so cups alone may be more suitable. My software is easy to use to reduce pics, so I am happy to do that. I think the cans alone will be fine, as you have listed what colour saucers go with each can. photos as requested. maybe these should be deleted once you have copied them as they take time to load and are all illustrated above. The coffee can photos are absolutely brilliant Jeremy!! They load quickly for me .... please leave them there. I can now easily see the difference between the handpainted and the transfer mogambo patterns. I overlooked the patterns Image and Saraband and I don't see Mexico ..we don't have those patterns yet. I have only ever seen one brown C&S saucer. 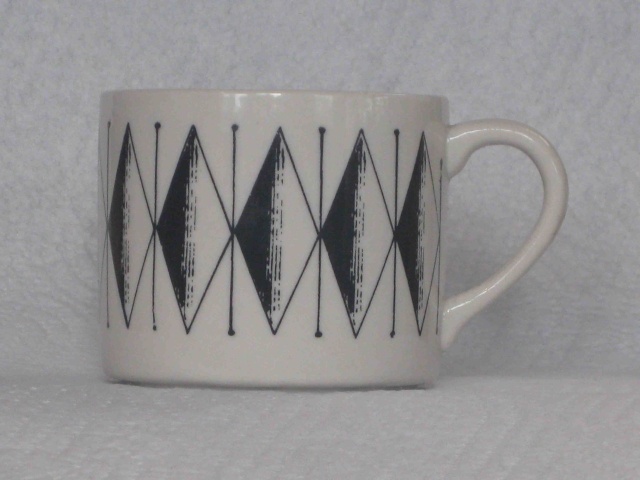 I obtained mine from a 2nd hand shop in Te Aroha, cups from elsewhere. Dare I say it, your age is showing! Wow!! You guys make a formidable tableware team!! Thanks so much for Mexico and Saraband pics Jeremy. Mexico is one of my favourites... with it's gorgeous burgundy saucer! You know I can't remember if they were Crown Lynn or some imported ware? You mentioned a saucer with abbreviated maker.. I'm wondering if our Napoli was made by someone else. They came beautifully packed in a special box.... like Crown Lynn would have had perhaps....? The first set I made up and gave away was Image transfer. It is just so ubiquitous. I barely notice it. Pictures tomorrow if the light's good. I prefer not to flash but sometimes the camera takes over. I hope the pictures will clearly show the difference between hand-painted and transfer. On the former the background lines are faint, and the segments appear to have been applied with a sponge, have a stippled texture and look golden. I think the same on the transfer look dirty. 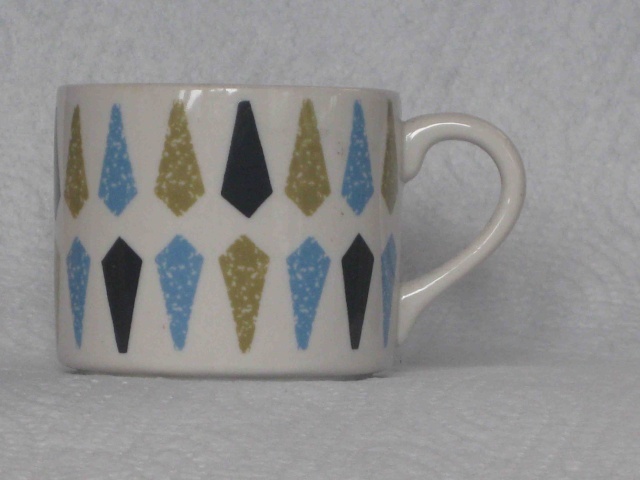 This is the Mexico cup and saucer that I came across the other day .... it wasn't on trademe at all!! I see it costs money to subscribe to see price, location etc. 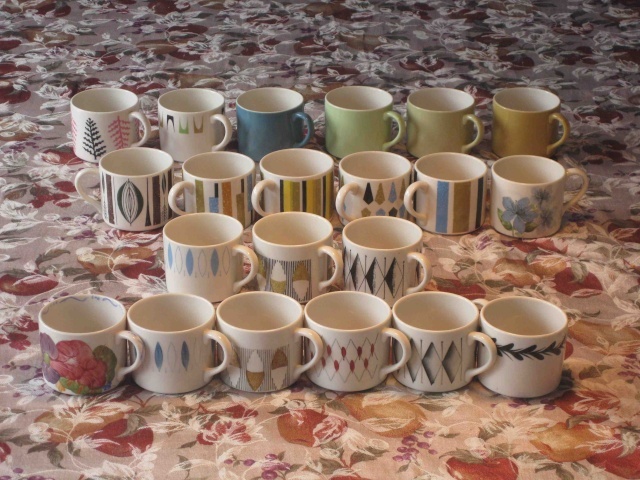 I think I have enough cups (they have kept popping up as I've looked for bits and pieces this last week), but I may be short of a saucer or two for a 6-set. Saraband, Tacoma and Mogambo popped up on trademe today... and the trader has a Rostrand set too!